We Will Rock You - half price tickets for summer 2009 West End shows! Now in it's eighth year, the multi award-winning musical featuring the hit songs of Queen, 'We Will Rock You' has been a resounding success. 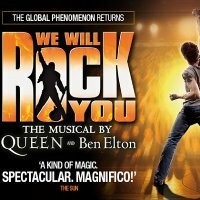 Written by award-winning comedian and author Ben Elton in collaboration with Queen's guitarist Brian May and drummer Roger Taylor, We Will Rock You debuted in the West End in 2002 at it's present location - the Dominion Theatre. We are pleased to be able to offer you half price tickets for the best seats in the house - £27.50 of £30 (+ booking) for seats which are normally £55 or £60. The offer runs until 17th July and is valid for all midweek performances (Monday to Friday) and Saturday matinee performances - subject to availability. The starting price for standard tickets is £40.